Fun fact: I love mustard. I love it on hot dogs, hot pretzels, hamburgers, even on Cheez-It crackers (you should try it, really). You can mix it into sauces and dressings. And, did you know if you put mustard on your sunburnt skin that it will neutralize the sting of the burn? That’s a free, no-fail home remedy for you there. You’re welcome. I guess I know some things about mustard, but I admit I don’t know much about mustard seeds. I was surprised the first time I saw one. It was so tiny! And rock hard! I remember thinking of Jesus at that moment and being amazed that that was all the size of faith He told us to have. It’s one of His more famous quotes, I think. But did you know that Jesus talked about mustard seeds one other time? There is yet a second parable He uses to illustrate faith found in Matthew 13:31-32. It’s super short, but mighty powerful. Following the parable of the sower and separating good wheat from evil tares, Jesus immediately launches into another story. This one is about a mustard seed where He again likens something to the kingdom of heaven. You’ll see He repeatedly uses analogies to illustrate what heaven is like in Matthew 13. In this illustration, a farmer plants a mustard seed in his field. 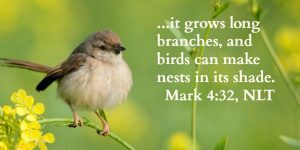 Now, at first we might read this whole parable and think Jesus is simply talking about a tiny seed growing into a mighty tree big enough to hold a bunch of birds. So, we might conclude that He’s repeating His lesson about having the amount of faith we should have. Sort of, but nope, which must be why the disciples were always confused by Jesus’ parables. There’s more to them than you think. If you ever have the time, it’s so helpful to learn about the culture and landscape of Jesus’ time. It will truly help you understand the Bible so much better. 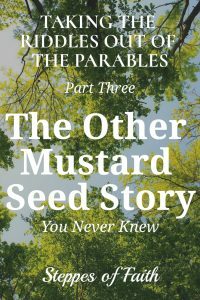 So, here’s a quick agriculture fact to help you understand the parable of the mustard seed. Mustard trees in America are not the same as the ones that grow in Palestine/Israel and its surrounding areas. Palestinian mustard plants don’t grow into trees. They’re actually bushes. Huge, enormous tree-like bushes that can grow up to 15 feet tall. A bush- or any plant for that matter- that tall would easily be big enough to hold a bunch of birds, right? But, Jesus isn’t talking about birds. He’s talking about people. 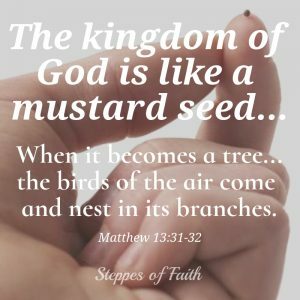 The meaning here is that if the kingdom of heaven is like an enormous plant with room enough for entire flocks of birds, then heaven has enough room for God’s children. It’s important to recognize that Jesus isn’t talking only about the Israelites. He’s talking about anyone- Jew or Gentile- who believes He is the promised Messiah, that He died on the cross, and He rose again three days later to conquer death and sin. The idea of allowing non-Jews into God’s kingdom must have been shocking to the Israelites. It was almost blasphemous to suggest such a thing. What they didn’t know, apparently, was that it had already been prophesied in the Old Testament several times. Ezekiel foreshadows what Jesus says in His mustard seed parable and what we know is true today. Jews and non-Jews alike are welcome in God’s kingdom of heaven. Heaven is the big, strong tree (or bush as the case may be) where all who believe in Jesus live as we dwell in His protective shadow. Daniel also referred to the inclusion of everyone when he interpreted a dream for King Nebuchadnezzar in Daniel 3. Though the dream is about Babylon and its ultimate destruction, in verse 21 Daniel mentions that heaven is open to everyone. Again, the children of God are illustrated as birds coming from all over the earth and living in the branches of God’s heaven, a place of protection and abundance. But, first we must have faith the size of a mustard seed to ever see it. Heaven is a place for everyone. No matter who you are, where you come from, or what you’ve done, God has a spot waiting for you. Your faith is the key to getting there. 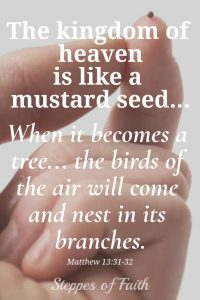 Plant your mustard seed and watch your faith grow so one day you can join your brothers and sisters in Christ from all nations together dwelling in God’s enormous, beautiful heaven. Having faith the size of a mustard seed can be difficult sometimes. How has God increased your faith over the years? How have you become stronger? Or, maybe you’re struggling. Will you share your stories with us? Let’s lift each other up and move some mountains together! My friend, Deborah, has written a great book that will help you take a closer look at Jesus’ parables. She’s made it super easy for you to download. It’s only $5 for Kindle and free if you have Kindle Unlimited. You can’t beat that! Click here to learn more.